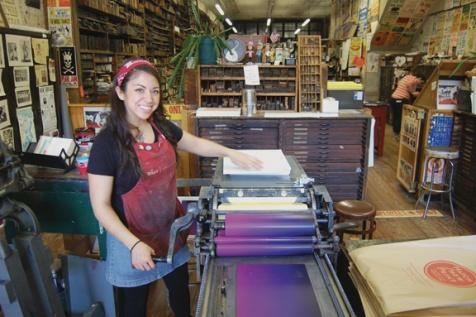 Heather Moulder runs a Vandercook proofing press in the colorful Hatch Show Print shop. Cannon County native daughter Heather Moulder does a crackerjack job of describing herself. "I am a graphic designer, printmaker and tune twanger from Woodbury. By day I'm at my favorite 133-year-old letterpress shop this side of the Duck River. In my off hours, I'm working towards making things, playing lots of music and meeting as many interesting folks as I can," she writes from her lordymercy.com Web site. Moulder, 25, makes posters for historic Hatch Show Print on Nashville's Lower Broadway. Otherwise, she's making music in the 'Boro or anywhere else that the soul/blues band Rhythm Kitchen can play; or she is painting or designing CD covers for the Arts Center of Cannon County's Spring Fed Records. While it seems Moulder might be a modern young woman grabbing for all the gusto she can get, her artwork, such as a her watercolor stone lithograph "Thirty Four Point Buck" and her imaginative commentary on society's yen for quick remedies and easy solutions, illustrated by a series of snake oil bottles (check out her Web site), reflect someone very much connected to her rural roots and customs. "I think it kind of goes back to I love folklore and old stories," she says of her drawings and eclectic designs. "I go all the time to the Old Feed Store [antique mall] in Woodbury and walk around and look at the objects and think of where they could have come from. I really just love stories and traditions and working those memories and tales into my work." Moulder grew up a few miles south of Woodbury in the Woodland community, the daughter of Billy and Tess Moulder. Her dad is a guitarist and singer, who makes praise music in church but also plays classic rock at other times. Her grandfather Burton Moulder served as sheriff of Cannon County from 1968 to 1972. A 2005 graduate of Cannon County High School, Heather earned a graphic design degree from Middle Tennessee State University in 2011, where she attended the Southern Girls Rock and Roll Camp the summer of her senior year in high school. "I have volunteered there ever since. I teach silkscreen and have taught keyboards and been a band manager," she said. "Some of my first silkscreen classes were at Southern Girls Rock and Roll Camp, taught by the folks who run Grand Palace Silkscreen. It was really great to see that there were folks making a living in printing." Moulder interned at Hatch Show Print the fall of 2010 and was hired the next summer. It's a small shop with 10 employees, seven of them designer-printers, and a place spilling over with a rich history in pop and country music dating back to the 1879s. "Most of us are designers and printers. The designer is the printer. You see the whole job through," she says of her vocation. "We communicate with the client and talk about the design. We work from black and white on a page of text and from there we sketch out ideas. From that sketch we will compose wood and metal types, all backwards. We compose and lay it out and typeset the poster. We then put that on the press, we ink it and we print them one poster at a time and one color at a time." Thanks to places like Hatch Show Print, her craft has not become a dying art, a fact that Moulder, who has created approximately 75 posters, has not missed. "I really enjoy getting to print on the press. I feel it's a rare situation to get to work at the scale we do in that letterpress environment. Getting to crank by hand is pretty cool," she said. "It's very rare to find a place I can put my both my design and printmaking together." And Moulder's gifts and positive attitude have not gone unnoticed. Says Hatch Show Print manager Jim Sherraden, "With Heather we received a three-fer: That she was not only talented, she was local, from MTSU, and her affection for homegrown regional music fits in nicely with the heritage of Hatch. She's completely one of the most responsible folks we've ever hired here and a darn fine singer." While working at Hatch, Moulder has met a few fine singers herself such as Robert Plant, Vince Gill, Donovan and Grace Potter. Moulder commuted to downtown Nashville from Woodbury for more than a year and moved to Music City in November. However, she continues to serve on the board of the Arts Center of Cannon County. "There's a lot of generations involved on the Arts Center board," she said. "I feel like when I was in college, it was nice to bring that demographic to the table. The Arts Center is really important to me with the folklore, the history, the theater and record label. I think about how to get that out to people my age as well as all ages." Moulder became involved with the Arts Center while in high school, helping with musicals such as "Annie," and even served as music director for "Chicago" last fall. That's not all. "She designed one of our factory CDs, "The Fairfield Four: Revival." And she designed an entire series of print-on-demand CDs, the Spring Fed Records/Davis Unlimited Series," said Evan Hatch, folklorist at the Arts Center. " She at the end of the project will have designed 31 covers, discs and liner notes. "Heather is a dream to work with. She's got the skills, obviously. But she combines those with a tireless work ethic, vision and understanding and love of the music she represents. Not even to mention, she tells everyone she knows about our humble little record label," said Hatch. Meanwhile, Moulder never ceases to make her own kind of music. She and her ex-college roommate have an old-timey band called Good Luck Ola. They continue to write songs and make simple music videos that they post online, even though her friend now lives in Halifax, Nova Scotia. Closer to home, Moulder plays keyboards, sings and write songs with Murfreesboro-based Rhythm Kitchen, a soul/blues music group that includes vocalist Skylar Gregg, guitarist Joey Fletcher and drummer Jake Winebrenner. The band plays the Boro's Wall Street at 10 p.m. March 9. "We're working on recording an album of original music right now. We started out playing a lot of covers and found common ground in old-time and blues-roots music, but we got excited about writing some of our own song. So hopefully in couple of months we'll have it wrapped up." Moulder maintains a cool Web site, lordymercy.com, where she blogs a bit but also displays a collection of her artwork, designs and current projects. As for down the road, Cannon County's creative spirit says, "I feel like any big goals past Hatch would be doing more in music, like having an album and touring, but also I've often thought of going to grad school and studying printmaking a little more." Super talanted young lady! I really enjoy watching her play keyboard.